This verse is not as straightforward as you might think. In this context, the word conversation has nothing to do with what you say. It actually means what you do or your lifestyle. Your lifestyle speaks volumes about who you are. Since as a Christian, Jesus saved us and is changing who we actually are. It is called sanctification. Since we are progressively being changed by the Holy Spirit, our lifestyle should be changing as well. As this verse is saying, does your lifestyle preach the gospel to the unsaved world? Do you act different from unsaved people or are you just like them? Throughout the Bible, God tells us ways how we can act differently from the world. We just need to go find those verses. For instance, Philippians 2:3 mentions how Christians should esteem others over themselves. Do you do that? Philippians 2:7 reminds us of how Christ, the Creator of all, took the form of a servant. Do you serve others? Unsaved people murmur or complain all the time. Philippians 2:17 reinforces that we can be different from the world by not complaining. 1 Corinthians 10:31 tells us that everything we do needs to be done for the glory of God. If your life is a sacrifice to God, you will work hard at everything you do. Do you? Matthew 28:19-20 tells us we need to go into the world and give the gospel to as many people as possible and disciple new believers. 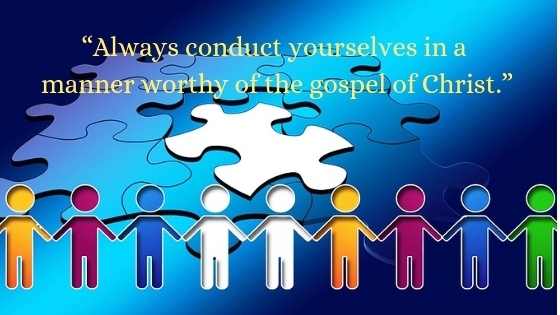 Do you know how to give the gospel, nonetheless have you done it? The point is, our lifestyle should radiate the gospel, not just with our words, but our actions as well. Does yours? The Bible is one of the hardest books I’ve ever had to read. I’ve had to read through it for one of my classes and it’s a lot. But it’s really really interesting. I’m not a religious person , but I do appreciate all religions and what they stand for. They all have so many interesting stories to read through. Hey Ty, thanks for your comment. Many claim that the Bible is one of the hardest books to read and understand, that is because it was written at a different time and culture. However, let me say that having the right tools will help us understand what God is telling us through His written word. Since the Bible is a collection of books written during a span of 1500 years, readers should interpret them taking into consideration the type of literature. By the way, the Bible is not just another story book, it’s God’s story and His love for mankind. This love is so great and unconditional that He gave His Son to die on the cross for our sins. When one receives the gift of salvation that God is offering, that person becomes a new creation begins to understand that he does not belong to the world anymore. Instead, he now belongs to the kingdom of God so he starts living not as a citizen of the earth but of heaven. Yup, there are so many religions in the world but what makes Christianity unique is the fact that salvation is a gift and not something we earn. I agree that we must respect other religions but if we truly love them, we need to tell them the truth, even if it’s going to hurt them. We have all sinned and fallen short of the glory of God (Romans 3:23). This means. we are all condemned to hell but because of God’s love, He took the punishment upon Himself just so we will have eternal life. Shalom and God bless you! Our number 1 Recommended Bible Study Resource for Everyone. Get it now! An excellent guide for students, pastors, and Bible teachers in the development and delivery of expository sermons. Learn how to build your own website for free. Join me in an amazing community of people who love to help one another succeed.